​This guild was formed in 2002 in Austin, Texas and members have enjoyed weaving and learning together ever since. 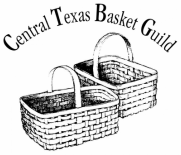 We are a not-for-profit organization dedicated to the teaching and sharing of basketmaking ideas and skills. Throughout the year the guild members participate in many events to stimulate interest in and promote the art of basketry. As a group, we weave various baskets together bi-monthly. Members can bring their own weaving project or weave the group project. We love visitors! There are many members who can help you with your weaving project. Check out the baskets we will be weaving at our meetings by clicking on the "Meetings for 2019" tab. Twice a year we hold Special Weaving Workshops with Visiting Instructors. To see we what Visiting Weaving Instructor we have scheduled, click on the "More" tab, then click on "Special Workshops" tab from the drop down menu. Annual charity project - in October CTBG members weave & fill baskets with bath products to be donated to the Safe Place, a women's shelter in Austin.